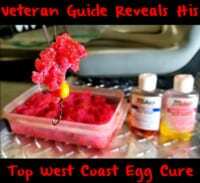 Curing eggs can be fun and easy. Below is how we cure our eggs when targeting king salmon on Ship Creek in Anchorage, Alaska. When fishing Ship Creek for king salmon I like my eggs to be a bright red. Meanwhile, when fishing pressure is extremely high I’ll cure some eggs in orange, just to show them something different. I don’t like using borax based cures here. Instead, I focus on sulfite cures and use Fire Cure exclusively. Keep in mind this cure is for kings. I tweak it later in the summer when silvers arrive. The following is the exact recipe we use daily. This is what all our salmon have been caught with this season and last. We’ve been fortunate to put our clients on lots of nice kings, even this early in the season. 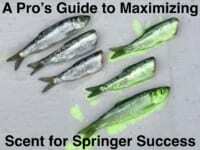 It’s important to start with clean salmon eggs. Make sure that there’s no blood in the eggs. I always recommend bleeding the salmon right when it’s caught. This helps release blood so it doesn’t get held up in the eggs. Take skeins and butterfly them prior to placing them on a paper towel. Evenly cover all portions of the eggs with Red Fire Cure. It’s important to massage the cure into the eggs. This ensures that no eggs are left without any cure. Place the eggs into a plastic container, cover it and store them in the refrigerator for 24-36 hours. Rotate them every couple of hours. This is where the magic happens. The eggs begin to juice and give off renderings during the curing process. Further along in the curing process the eggs begin to soak back up the juices, which make a firmer egg cluster. Now its time to pull them out of the containers and lay them out in a cool place (out of the direct sunlight) to let them air dry for a couple of hours. We prefer our eggs to be tacky and dry to the touch. Once we have achieved this we are ready to fish the eggs. For Ship Creek I recommend cutting the skein into pieces about the size of a half dollar. At Ship Creek we add a Spin N Glo because it gives flash and attraction to our baits. The key is for the Spin N Glo to continue rotating in the current. It’s giving off vibrations that the fish can sense. I usually use size zero, but color doesn’t really matter. Editor’s Note: Dustin Slinker operates The Bait Shack along the banks of Ship Creek. The Bait Shack is the only streamside bait & tackle shop and sells licenses, offers gear rentals and guide services on Ship Creek. For more info please visit www.thebaitshackak.com or https://www.facebook.com/thebaitshack. Pautzke Fire Cure is available locally at Bass Pro, Walmart, Fred Meyer, Sportsman’s Warehouse and B&J.